Typically when one mentions Rushville, Indiana folks may begin to reminisce about the well-known Durbin Hotel and their famous sugar cream pies, but tucked away on the southeast side of Rush County stands the legacy of one of Rush Counties most beloved and respected farmers; Dan Gettinger and the Gettinger Chi Cattle operation. Danny, along with his bride, Barbara, first started farming in the late 1950's in Rush county, Indiana. As many young farmers need to start somewhere, Danny and Barbara took a leap of faith to establish what is now a successful family business by starting out with row crop and hogs. Chi cattle became a part of the operation when the Gettingers first purchased 40 heifers from Craig Shielder and Paul Clapp in 1978. All of these heifers were 25% Chi and were bred by a full blood bull bought at an ACA Sale. The original cow herd was developed from these heifers. "We were drawn to the Chi breed by seeing the cattle at ranches such as the Hullingers, Adamsons, Horselys, and Bellars.... Craig Shielder was one of the individuals that probably influenced us the most," says son, Jeff. After those first 40 head were easily settled on ‘Gettinger ground' the family desired to bring three times the original herd size. Presently, the Gettingers run about 120 Chi influenced cows along with approximately 1000 acres of row crop. Dan passed away in October of 2008. The owners of the operation today are Barbara Gettinger, Jeff and Lisa Gettinger, and Larry and Michele Gettinger, with the help of Jeff's son, Sam Gettinger and his wife Sarah. Jeff and Larry operate the grain operation as well as the cattle operation with part time help from Sam. Jeff spent most of his life around show cattle and within the industry. His two sons, Sam and Tyler naturally have been involved with show cattle throughout their livelihood as well. The Gettinger family agrees that even though everyone goes through periods in this "realm" of losing interest of always preparing for the show ring, showing cattle together has been great for their family and plans to continue the tradition with the next generation. "Gettinger Chiangus also believes that cattle husbandry is something that cannot be taught. The more time you spend around your cattle, the more productive your herd will be. Start small and work your way up. If you are in the show cattle business, try and be consistent with your cattle and focus on productivity." 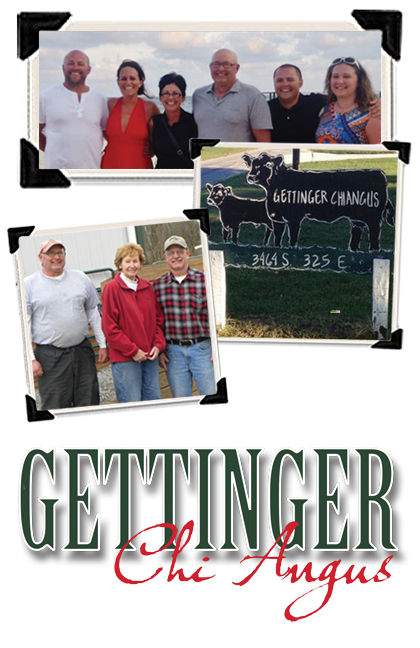 The Gettinger Family believes the biggest thing in getting people to utilize Chi genetics is just getting them to come see the cattle. "People are always impressed with how good of mothers Chi cows are. Chi cattle have longevity that will outlast any breed. Some of their oldest cows (10 to 15 years old) will continue to raise the biggest and best calves. Our cows produce heifers and bulls that can be introduced into any herd and will produce great maternal genetics." An integral component to the Chi Breed is they can be introduced with any other breed to create cattle that will produce year after year. Gettinger Chiangus has introduced purebred genetics from other breeds that have 16 Indiana Beef Winter 2013 produced great cattle with having an influence from their Chi-based genetics. For the past three years, Gettinger Chiangus has held a private treaty bid off of bred heifers and heifer calves. Their sale is held in September, where approximately 50 bred heifers 15 heifer calves and about 8 bull calves are on display for not only young showmen and women, but for the commercial herds as well. For the last few years Gettinger Chiangus has ran feed trials for Purina Mills. In 2010, they introduced the Accuration Feed, while in 2011 they introduced the Accuration Link Tank to the Bred Heifers. Purina Mills has been running this program on the Saturday during the Private Treaty sale. On Saturday night, Falmouth Farm Supply, the local Purina dealer, hosts a Ribeye Steak dinner during the Purina program. This year ShowStock U and Purina put on a clinic informing buyers of the different techniques not only used for fitting before the show, but daily care. The other component derived from Purina's team that gave nutritional information based on different feed and supplements that can be used to best suit one's herd or show calf. Gettinger Chiangus would like to give special thanks to Dave Newsom and Mike Witte of Purina Mills and Dave Burkhardt of Falmouth Farm Supply. As Jeff stated, their customer base has grown throughout the years. "We sell a majority of our bred heifers to herds in the Central Indiana area, while this past year selling both bred heifers and heifer calves to other states. Our heifers are usually between 10% and 25% Chi. All of our heifers are bred for calving ease to Angus and Chiangus bulls so we insure easy calving for their first calf. The biggest comments we receive are that our cattle are very docile and easy keeping. Many people like the fact that our cattle maintain some size and are easy fleshing and take care of the calves on their own." "We raise chi cattle because they produce cattle that are easy going and produce beef that can compete with any other breed when taken to market. These cattle can also produce style and soundness when you want to go to the show ring." As if spending time in the fields, at shows or in the pastures tending to their stock has not been enough, in 2012, Lisa, and sons, Sam and Tyler as well as Sam's wife, Sarah and Tyler's wife, Jackie purchased a meat locker in Rush County where the Gettinger's butcher cattle, hogs, lamb, goats and venison. 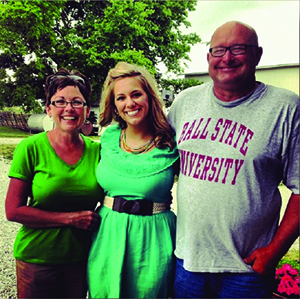 In September of 2013, the family opened a retail store in Rushville, where they have a full service deli and butcher shop. Their sales include cattle and hogs throughout the store as well as keeping up with the demand of box meat. Gettinger Meats is known for their smoked products, such as pork chops, bacon beef strips, summer sausage and many different sausage links.